It’s quite incredible to think that Marylebone high street is not a semi-rural village nestled on the outskirts of the city. Instead, the mutinous carnage of Oxford Street ebbs dangerously close to one end. The other end, meanwhile, is just feet away from herds of tourists descending upon Madame Tussauds to pose for selfies with waxworks that are often amazingly less synthetic than the celebrities they’re modelled on. Falling towards the latter, the northern-most end, Orrery is a quintessentially French restaurant upon the first floor of an old converted stables block, with the narrow room’s large arched windows allowing light to flood the airy dining space even on the dreariest of winter afternoons. Alongside the pale colour scheme, light wood furnishing and crisp white table linen, the venue’s key feature is an actual orrery: a mechanical model of the solar system, very popular during the late 1800s. As for the menu, the delicately decadent French cooking that’s on offer manages to display Chef Patron Igor Tymchyshyn’s vast experience of working in kitchens of fine dining establishments. Although excessively luxurious ingredients aren’t strictly necessary to provide a first-class meal, improper cooking of such ingredients is one of the most infuriating travesties to regularly take place in many of London’s high-end kitchens. 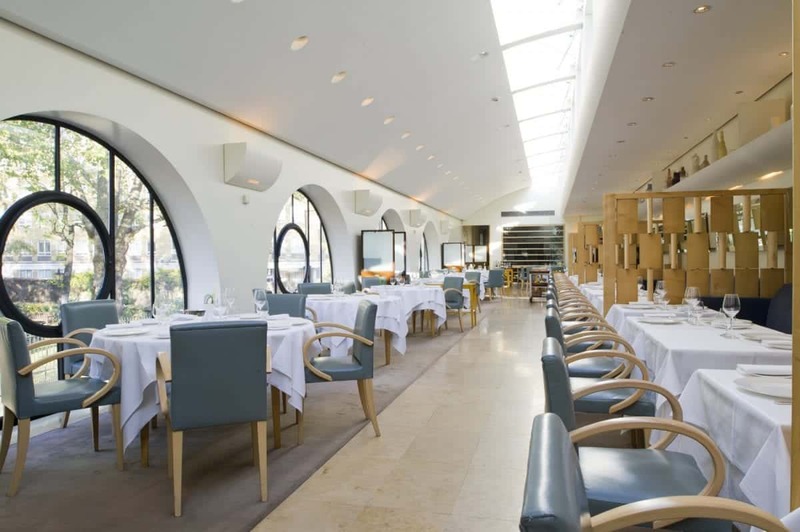 Fortunately, that is not the case at Orrery, offering plenty of well-cooked and prepared ingredients such as foie gras, truffles and expensive cuts of meat, as well as a surprisingly strong focus on fish. While the menu, alike most restaurants of this caliber, is constantly changing, it’s surprisingly that not one but two of the lunchtime A La Carte menu’s starter choices are based around foie gras. The first, a terrine of the duck type was inherently richer than the pricier goose alternative, and while the Riesling jelly was less exciting and delivered less to the dish than we’d hoped – a warm apple chutney managed to cut through the richness of the dish and work harmoniously without overpowering the key component. The overall undisputed standout dish was, conversely, the second of the two aforementioned starters: ravioli of confit duck and foie gras, pressed into slightly al dente pasta shells and accompanied by an equally indulgent consommé of Madeira to add a further element of sweetness to the dish and punish my arteries for ordering something that’s still so controversial in the world of butchery. Next, Périgord truffle risotto is a dish that’s not easy to present prettily, the result is often – as it is here – a bowl of what looks like something that’s been topped with all sorts of woody foliage and scooped from a guttering pipe after a harsh winter. It’s fair to say that the dish looks most aesthetically unappetising, though the taste of the simple vegetarian dish was comforting and pleasant. My rump of lamb dish, on the other hand, was the most impeccably cooked lamb to ever arrive at the table without any enquiry as to personal preference. Quite fortunately I’m a big fan of the French’s fear of overcooking, though many would have been less impressed. This was accompanied by a selection of roasted seasonal vegetables, some complimenting the overall dish, others slightly unwelcome, and a dribble of rosemary jus that lacked the depth that could be expected from the delightful, woody herb. To complete the meal, a selection of sweet treats is available, yet it’s the famous cheese trolley that’s most impossible to resist. 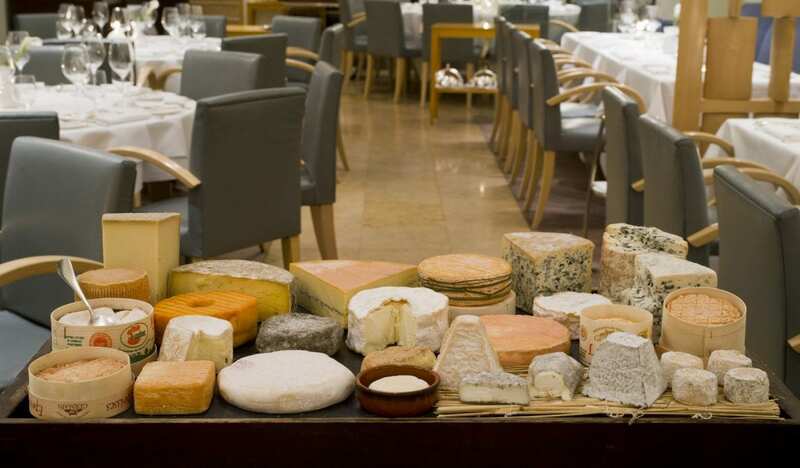 Combining three tiers of fromage heaven, with about 30 different variations to choose from, this was king of any dessert menu, and an ideal way to round-off a profligate adventure through French cuisine such as the one at Orrery. Orrery can be found at 55 Marylebone High Street, London, W1U 5RB.